Sorry to inform you – Arduino Programming Language really does not exit but newbies search for it. 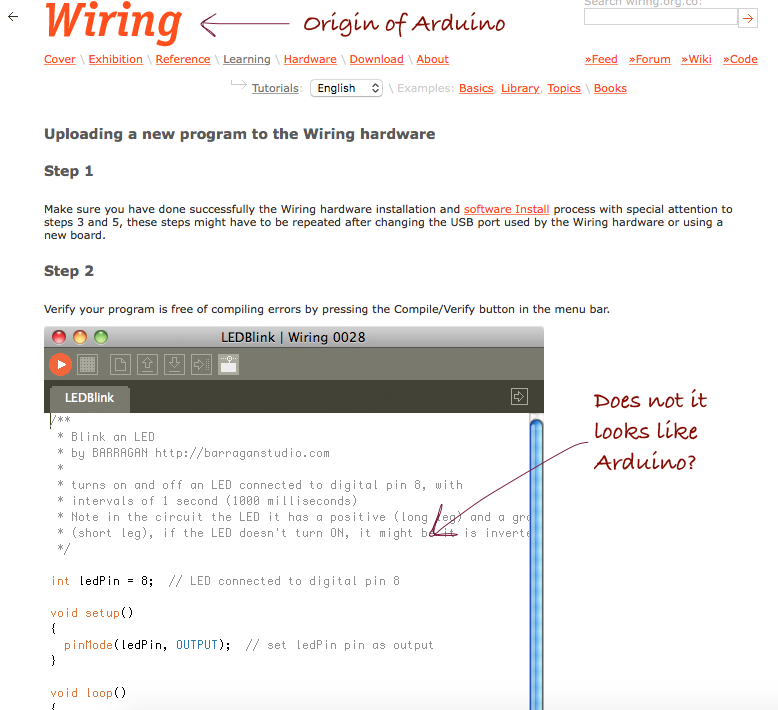 Our this guide on Arduino programming language tutorial explains where from that “language” originated. Also why we talk about writing codes in C++, C language. Please understand that .ino file, functions like digitalWrite() hides the real programming language. Most of us possibly need to use digitalWrite() like “functions” but we know at least few languages including C, C++ for 2 decades from now. When we are trying to think for Arduino, it not going to harm us. But a new to programming or electronics can severely get affected with these abstractions. At worst, Arduino’s official sites promote the phrase as if it is a new language. Wiring was created in 2003 by Hernando Barragán of Colombia when he was working for Masters degree thesis. Massimo Banzi, who is a founder of Arduino was a supervisor for his thesis. Hernando continued development of Wiring project. Massimo was one who started the Arduino project in Italy using the same Wiring software as a base with cheaper hardware. With regular update, Arduino has additions made to Wiring. Sadly, this story is towards There is no recognition by the Arduino team. It is not that Arduino returns nothing to Wiring but the way it is told that the story often remain hidden. Wiring incubated the idea of building a microcontroller based simple hardware controller platform. The original idea was to develop so easy things so that the artists can code. That explains the name “sketch” instead of “snippet” or “code”. The Arduino compiler/IDE accepts C and C++. In fact many of the libraries are written in C++. So “Arduino Programming Language” is C++ or C. In practice, programming for Arduino is not exactly the same as like our general C++. A lot of the differences are common in embedded programming to limit memory and processing power. If you use the official Arduino IDE then there are all sorts of limitations can show up. To gain full flexibility and all the advantages of C or C++, we often talk about some use a third-party IDE such as Eclipse or setup we described before. Wiring development board has a different processor, which is more robust hardware than Aduino Duemilanove with more I/O pins, more memory, more interrupts but Arduino Mega is bigger hammer. Be it Wiring or Arduino, the base is C, C++. It is actually not very easy to blink a LED by a newbie with a microcontroller. This Article Has Been Shared 1454 Times! Cite this article as: Abhishek Ghosh, "Arduino Programming Language Tutorial," in The Customize Windows, September 22, 2017, April 21, 2019, https://thecustomizewindows.com/2017/09/arduino-programming-language-tutorial/.